I love Bon Appetit magazine. The end of 2009 saw the demise of Gourmet magazine published under the Conde Nast flag. 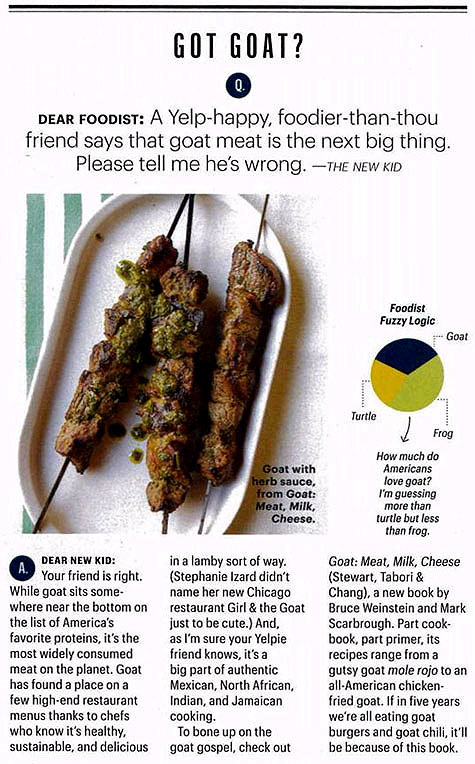 I used to buy Gourmet occasionally but just as the Gourmet diehards mourned the lost of their monthly fix, I reveled that it did not happen to Bon Appetit. I doubt it’s as much because one magazine was better than the other or even more to my liking; it was all about tradition. I’ve been reading Bon Appetit for over 30 years; every issue, every single one of them. In my young married life most recipes were too complicated and time consuming to plan for regular meals so I would find one or two and have our friends over to enjoy the effort with us. Even if I couldn’t find the time to actually make a dish, I just enjoyed the read…and read I did; cover to cover. Over the years I’ve seen the magazine change to accommodate a different generation and lifestyle changes. Few of us have the time to devote 2 hours to the family meal and that is reflected in the recipes included in today’s version. I’m grateful for Bon Appetit; it has played a huge role in my cooking experience and I am sure has helped me to become a better cook as a result. This recipe was the February cover recipe. It certainly embraced a time consuming tradition but was still easy to make. I haven’t made beef short ribs in a very long time and my house smelled delicious. 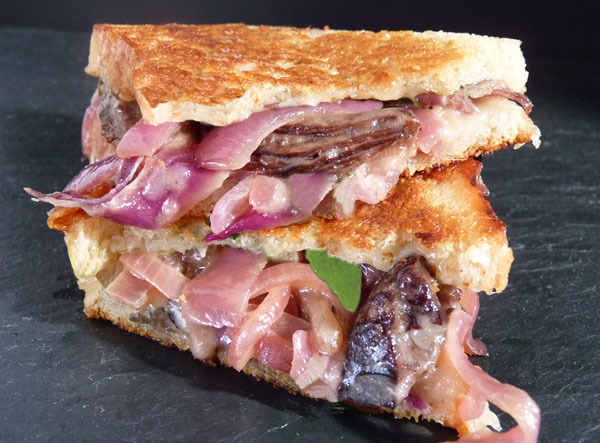 My guests had been anticipating this sandwich all day long as I let them choose from two recipes and we were not disappointed! I decided I wanted to try and shoot the accompanying photo to mimic the one on the Bon Appetit Cover. That was fun and exasperating; the arugula on the sandwich I made for the photo shoot was two days after my company and I was almost out of arugula so it all went on the sandwich. More melt in the cheese and my lettuce was wilted and not that appealing; so I found one little leaf to stick in there, sort of pathetic. I’ve got a lot to learn re lighting (and afraid a lot to buy too!) but I’m quickly turning my dining room into my own little photo studio. A corner by the window is not viewable from my foyer or my kitchen so it serves a functional purpose (the MOST function that room has ever seen) but keeps hidden my growing fascination with all things photographic. I must say, this sandwich was very good; but that time element required almost 4 hours to cook the short ribs. I would not hesitate to make it again, but next time will try some grilled flank steak and judge the difference to see if that substitute would make just as good a result. Sprinkle beef with salt and pepper. Melt butter in large wide pot over medium-high heat. Working in 2 batches, cook beef until browned, about 6 minutes per batch. Transfer to large rimmed baking sheet. Add celery, carrots, and onion to pot and sauté until beginning to soften and brown, stirring often, about 5 minutes. Add wine, broth, Sherry, garlic, bay leaves, and thyme sprig; bring to boil, scraping up browned bits. Season with salt and pepper. Return ribs to pot, propping up on sides and arranging in single layer. Cover, reduce heat to medium-low, and simmer 1 hour. Using tongs, turn ribs over in pot. Cover and simmer until ribs are tender and sauce is very thick, occasionally rearranging ribs in pot to prevent sticking, about 1 1/2 hours longer. Uncover and cool 30 minutes. Transfer ribs to work surface. Discard bay leaves and thyme sprig. Spoon off fat from sauce in pot. Remove meat from bones; discard bones. Cut meat into 3/4- to 1-inch pieces, trimming any fat. Return meat to pot. Add onions, sprinkle with salt, and sauté until beginning to brown, stirring frequently, about 10 minutes. Add vinegar and sugar and cook until almost all vinegar is absorbed, about 1 minute. Season with salt and pepper. Transfer to microwave-safe bowl; cool. Line 2 large rimmed baking sheets with waxed paper. Butter 8 bread slices; place 4 slices, buttered side down, on each prepared sheet. Divide short rib mixture among bread slices, about 1/2 cup for each. Spoon about 1/4 cup onions over each sandwich. Place large handful of arugula atop onions. Top with remaining 8 bread slices. Spread bread with butter. Heat griddle or 2 large skillets over medium heat. Working in batches, cook sandwiches until bread is golden brown and cheese melts, about 3 minutes per side. Transfer to work surface. Cut each in half on diagonal. Transfer to plates and serve. DO AHEAD Ribs can be made 2 days ahead. Chill until cold; cover and keep chilled. Rewarm just until lukewarm before using. Caramelized onions can be made 2 days ahead. Cover; chill. Microwave in 15-second intervals until lukewarm before using. 2007 Clos des Brusquierre Chateauneuf-du-Pape: Chateauneuf du Pape is a classic wine to pair with roast meat and short ribs. The 2007 vintage was outrageously good in the Southern Rhone, and made really big, fruit forward wines that are sure to compliment the savory short ribs and sweet caramelized onions. 2007 Bogle Petite Sirah: Petite Sirah is a dark, inky wine that is very fruit forward and intense. The intense fruit of this wine will match nicely with the slightly sweet onions, but have the tannin levels to match the hearty short ribs in the sandwich. Bogle is a large producer, known for their consistent yet affordable quality year in and year out. http://corkd.com/wine/view/103873-2007-bogle-vineyards-petite-sirah to Cork’d for providing us with wine reviews for our recipes! Great post. I just now for the first time ever subscribed to Bon Appetite. Love the first issue that arrived which must have been March. Missed this beautiful sandwich. Your photo is really good. I have never made short ribs, this is definitely a man’s meal! I may have to try it soon!